These gorgeous little desserts would be great after a dinner of meat and red wine! With a heavy knife chop the chocolate into pieces, place in a clean dry bowl over a pan of water and place over medium heat to melt. Pick through half the raspberries to remove any dirt, and place them in another pan with 1 Tbs. framboise and the sugar over medium high heat. With a fork or spoon, mash the raspberries while the sugar melts, cook for 3 to 4 minutes. 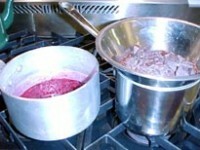 Pour the raspberry mixture into a bowl to cool. 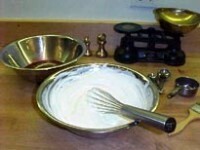 Place the cream in another bowl and whisk until it forms soft peaks. Fold this into the cooled raspberry mixture. Cut 1/4-inch slices from the pound cake, and cut out 2-inch circles of cake from each slice with a cookie cutter or glass. 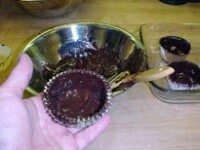 When the chocolate has melted, paint the inside of foil cups with about 1/8-inch thick coating of chocolate. It is best to loosen each foil cup, but keep it with two or three others while painting. Place the chocolate cups on a tray in the freezer until cold. When the chocolate cups are cold, carefully and quickly remove the foil from each cup—it is best to try to do this with your finger nails so the chocolate doesn’t melt from the heat of your fingers. 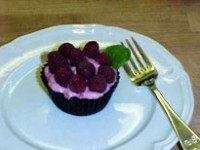 Place half a teaspoon of raspberry mousse on a dessert plate, then anchor a cup on that. Put a round of cake in the bottom of the cup, sprinkle with framboise, fill the cup with raspberry mousse, and cover the top with additional fresh raspberries. Decorate discretely with fresh mint. Do the same with each cup.